Kaitlin Clarke is an associate in our family law section. 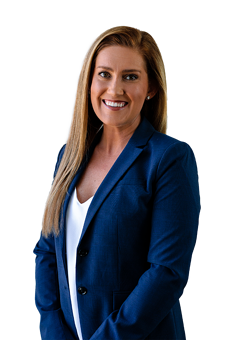 Mrs. Clarke is primarily focused on assisting families and individuals navigate through the complexities of family law related issues, such as divorce, child custody and child support, adoption, and guardianship. She also has experience in criminal law. Mrs. Clarke realized her passion for representing clients in family law matters while working in the OU Civil Legal Clinic during law school as a Licensed Legal Intern. Since that time, she has represented clients in a wide range of legal issues, but has continued to focus most of her career on her family law practice. Mrs. Clarke understands that family law related matters can cause a wide range of emotions. She hopes that her passion, patience, and knowledge serve as a calm during what may feel like a storm. In her free time, Kaitlin enjoys golfing and spending time with her husband and two dogs.